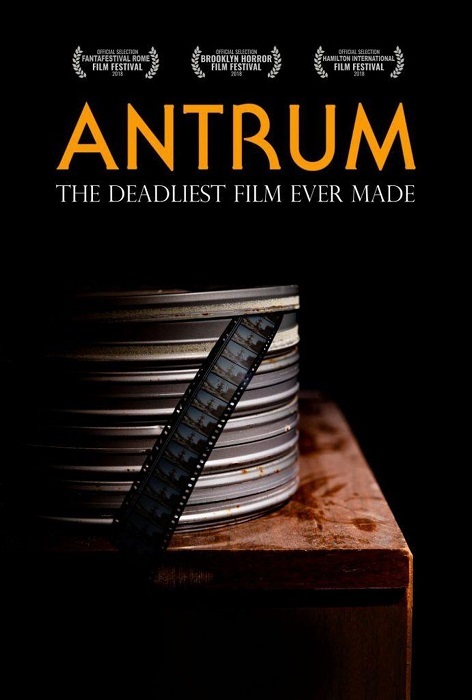 Mockumentary Antrum: The Deadliest Film Ever Made—created by David Amito and Michael Laicini—is the latest horror film project to use viral marketing in a bid to create a false sense of reality surrounding itself. The film is comprised of a pseudo-documentary that bookends a movie about a brother and sister, played by Rowan Smyth and Nicole Tompkins, who perform a dangerous occult ritual to rescue their dog from hell. There is no real-life evidence that any of the aforementioned tragedies actually occurred, because they didn’t. The film wasn’t even shot in the 1970s; it’s a modern movie using online viral marketing strategies similar to other mockumentaries like The Blair Witch Project and The Fourth Kind. According to a recent article in Forbes, writer/director/producer Eric Thirteen reportedly discovered the project while attending the Brooklyn Horror Film Festival, and the film’s legend was already growing as word of it spread. But while Thirteen has committed to selling the film’s false narrative, even he admits it shouldn’t be taken too seriously. “Even at the heart of the movie’s narrative is this notion of storytelling. How people become immersed in fiction. The directors think about the film as a haunted house, as something that an audience grants permission to scare them. People know a haunted house isn’t haunted, it’s not about that. We know Bloody Mary won’t appear, but we get more of a chill each time we say the name. Horror is the audience’s very willing ability to forfeit rationality,” said Thirteen. “It’s a movie that sort of demands counter takes on counter takes. There’s a certain level that says, ‘Ok, a haunted movie. Oh no, will I get cursed?’ And then there’s another level that says, ‘Of course you won’t be cursed by a movie, don’t be ridiculous.’ And then there is yet another level, where you’re still thinking about the film days afterwards. You want to show it to your friend, and when you show it to your friend, do you tell them it’s a cursed movie? Do you sort of make a cheeky joke about it? It’s in your life now, you’re talking about it, you're making decisions about it. The way the movie follows you in the real world, that’s the real curse. I want to see how that plays out, because part of the obsession of the movie is just wanting to know…what do other people think about this? How does it infect their brains?” he continued. It’s the suspense created by the viral marketing campaign that really completes the experience the film’s creators are attempting to curate, according to Thirteen. As part of this exercise in mythos building, Antrum: The Deadliest Film Ever Made will be shown at the Brussels International Film Festival this month prior to becoming available on a variety of platform in the U.S. at the end of 2019, and then throughout the world in 2020.